© Paul Lowe / Panos Pictures..Bucharest, Romania. 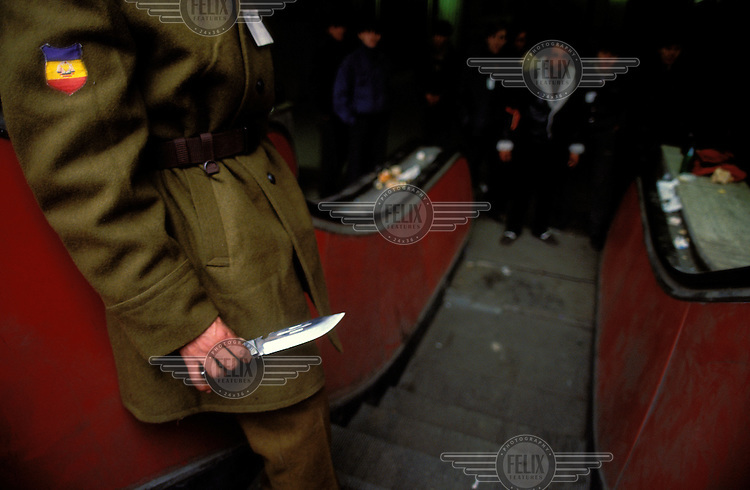 .Revolution, 22nd-25th December 1989...The army confiscate weapons from civilians at an underground railway station...The Romanian popular revolt and coup of December 1989 represented a decisive moment in the collapse of communism in Eastern Europe. An uprising which had begun a week earlier in the town of Timisoara spread to the capital city, Bucharest, with demonstrations leading to violent clashes in the streets. Nicolae Ceaucescu, President since 1974, lost the support of the army, who sided with ordinary civilians in street battles against the feared Securitate secret police force. As Ceaucescu and his wife Elena attempted to flee the country, they were captured, tried and executed. Their dead bodies were exhibited on television on Christmas Day. In just a few dramatic days, the country had rejected the communist system which had ruled since the Second World War. The slow and difficult transition to capitalism began.